In The Legend of Zelda: Majora's Mask, Peter Pan and Tinkerbell race to save Termina from a sentient hunk of green cheese. Link, what are you doing? What do the dolls do when no one is watching? Nix on the super powers. A plethora of unused content. Many unused items, including some leftovers from Ocarina of Time! Much of this text was removed in the international releases. O Navi, where art thou? If it works, why update it? A large number of differences exist between regions and revisions. Like in Ocarina of Time, the Triforce transition is still in most versions of the game, completely unused. You can make the Triforce transition appear anywhere with the following GameShark codes. 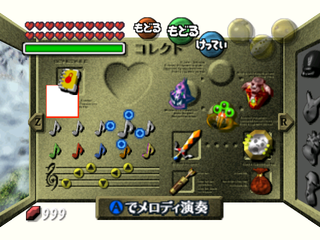 The game contains some leftover blank mini maps that were used as placeholders before the real ones were designed. 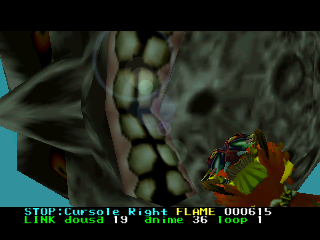 The model of the Iron Knuckle is almost the same as in Ocarina of Time. 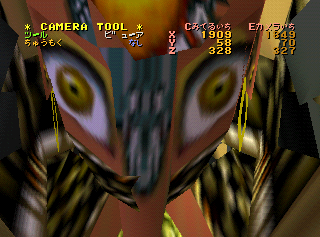 As such, it still contains the early version of Nabooru's head inside. One unused song can be found at the end of the list of songs used in the Quest Status subscreen. The song is at offset 0x0C8AC27 in the decoded Japanese version 1.0, and may also be present in other versions. It contains eight notes and is played with A, C-Down, C-Right, C-Left, C-Up, C-Left, C-Right, C-Down. The white square indicates the location of the slot. There's an unused item slot in the Quest Status Screen. This is likely a leftover from Ocarina of Time, which featured the Gold Skulltula icon in that position. The coordinates of the Japanese version 1.0 is 0x0CC7856 horizontal and 0x0CC78A6 vertical. An older version of the Clock Tower entrance can be seen in North Clock Town. You need to use Moonjump to hover out of bounds to the Clock Tower in the distance, then turn the camera so it shows the southern side (which normally isn't visible at all from North Clock Town). 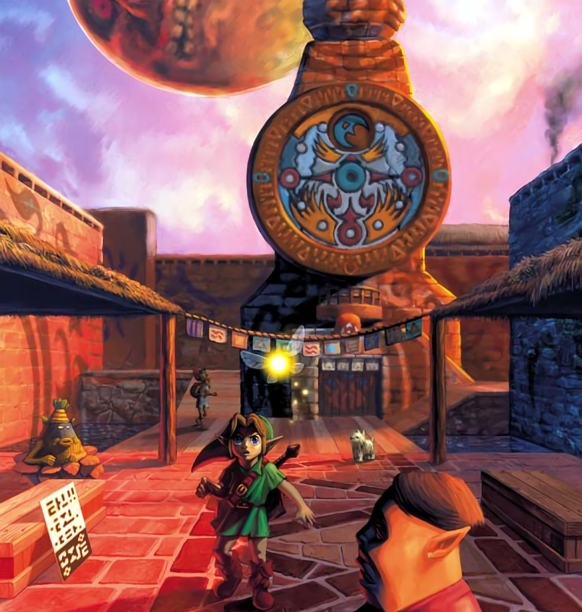 A piece of official concept art from Majora's Mask showcases the earlier design. The entrance looks different; most notably there's a fence and a path leads off to the right, which suggests you could simply walk up to the Clock Tower. Going west side of town you may see slight differences on the south side of the city. One can notice a wooden railing, Maybe the entrance to the tower is there before. The wall on the left is missing painting and the ramp near the owl statue is a piece of wood instead of bricks. 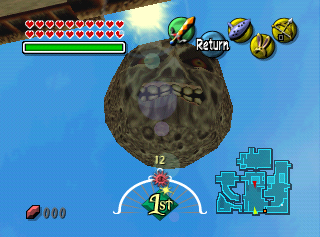 On the path between Mountain and Goron Village, while the area is cursed, there's a grotto hole suspended in mid-air above the area, where you can never reach it. It cannot even be seen unless you use Moonjump to hover over there. 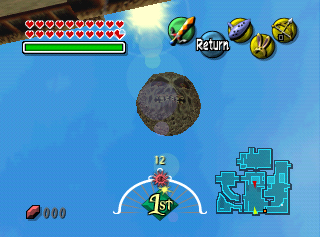 Trying to enter the grotto leads to one of the Termina Field grottoes with a bunch of Gossip Stones. 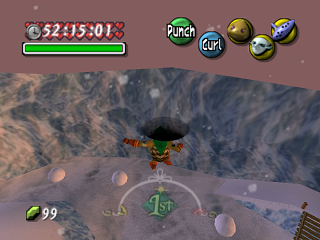 Playing the Song of Storms in front of the Gossip Stone that's situated before the room with the Iron Knuckle makes the ladder appear automatically, which skips the need to complete a Bombchu puzzle and hit an eye switch. 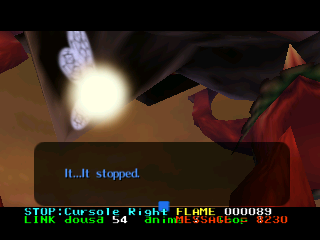 Playing the Song of Storms in front of the Gossip Stone on the left in the Iron Knuckle room unlocks the door in the room beyond, which skips the need to complete a Bombchu puzzle. Both of these bugs are still present in the 3DS remake. A similar instance of conflicting flags plagues Termina Field. When the player approaches the fence that leads to Great Bay, a message from Tatl is triggered, which sets a flag that is also responsible for planting a Magic Bean in the patch of soft soil next to the Astral Observatory. As a result, triggering Tatl's message causes a bean plant to appear in the soil when the area is reloaded. This bug is also present in the 3DS remake. For when the player really screws something up. Developer comments and debug messages hidden in the game files. 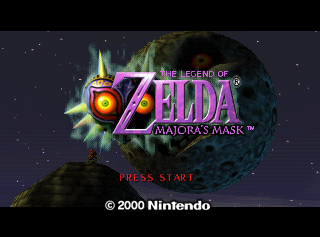 Just like its predecessor, Majora's Mask contains a map select which allows you to warp to any map. 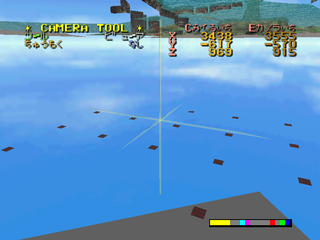 The map select does not differ too much from the one in Ocarina of Time, but it has an additional option for selecting the day. 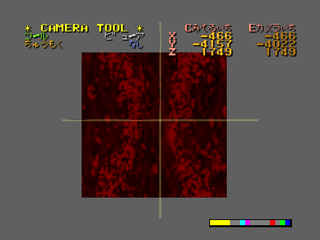 The non-Debug ROM version of the Map Select will, by default, drop you off in cutscene 00 of each map. The corresponding cutscene will not play, resulting in the interface being disabled, actors and objects being shuffled around, and exits not leading to their correct destinations. This also means that cutscenes with no maps can't be accessed. However, the codes available at the link below allow players to get around this issue. 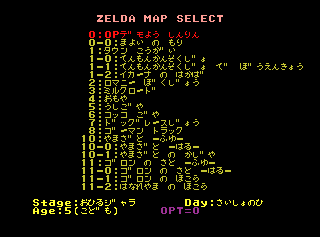 Further information on Map Select, including codes to enable it and information to navigate it, are available on the Debug ROM's map select page. On the other side of the tower, there's the Stone Tower blocks, complete with switches. The blocks and switches work fine, but the Elegy of Emptiness doesn't, so it's really pointless. A line of pots exists next to the pool. Inside the pool you'll find some Zoras. These appear to be the same Zoras you can find in the water at Great Bay. Also beside the pool, there's a group of birds. 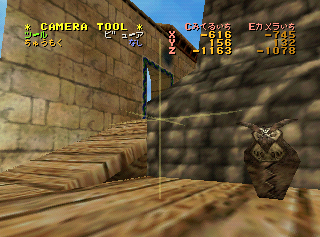 These birds were unused and mostly nonfunctional in Ocarina of Time, but work perfectly fine here, and are actually used on the moon (but they're really hard to spot). There's a source of light near the multicolored slope. You can deflect the light with the Mirror Shield if you have it, but there's no target in the vicinity. 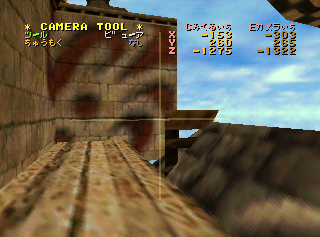 There are some crawlspaces leading through a wall, as they were used in the previous game. 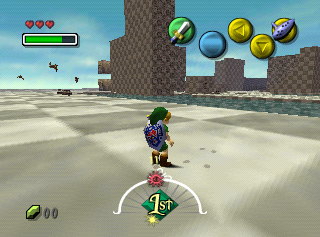 However, Link cannot crawl through them here, possibly due to the feature being removed. 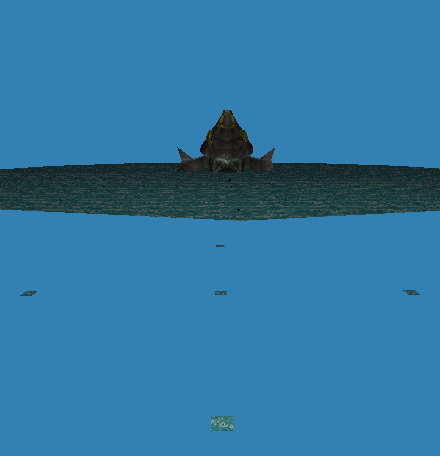 If you leave this map in any way (either by walking off the edge, drowning in the water or getting crushed by the Stone Tower blocks) you end up in the uncursed Southern Swamp next to the boat, with a rather glitchy fade-in. 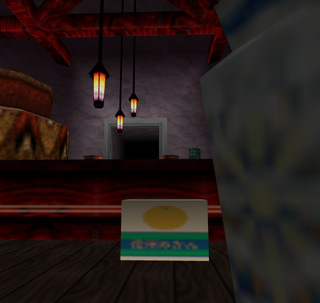 A box of oranges is present in the Potion Shop, serving as a seat for Kotake. 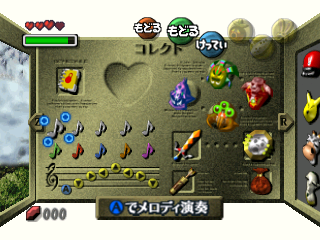 The box is adorned with text reading "Satsuma Mandarins", written once in kanji and twice in kanji and hiragana, making it one of the few examples of non-Hylian writing in Majora's Mask. 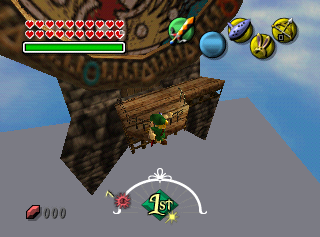 The box is still present with updated textures in the 3DS remake, and can be seen due to the changes in the camera mechanics allowing the player to position the camera behind the counter. Located in the southern part of the Great Bay are 17 large squares with the texture of the water, but red and completely inactive. It is possible that these squares were used by the developers to measure distance. There are also five squares underneath the entrance to the Great Bay Temple, located on the sides and center of the sea. When the current day is set to Day 0, the Moon will be higher in the map than it is on Day 1. It can be accessed with the code 801EF68B 0000 for US 1.0. 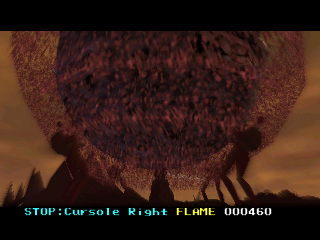 In the cutscene where the Four Giants stop the Moon, it is facing upwards, away from Clock Town. After that scene, however, the Moon returns to its original position. In the cutscene where the Moon is falling, there happens to be a second Moon inside the one that you normally see. By looking closely at the video, as well as by using the images above, you can see that the second moon seems to be the Moon that's loaded in the "On Top of the Clock Tower" Scene.